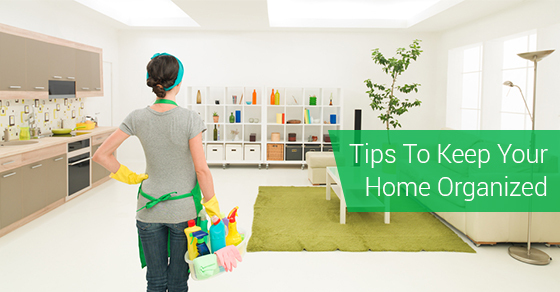 It’s not just that your home looks nice and presentable when it’s clean and tidy. According to an article by psychologist Sherrie Bourg Carter in Psychology Today, clutter and mess make us feel stressed out. A messy environment is visually jumbled and disorienting, makes us feel guilty and uneasy, not to mention very frustrated and upset when we can’t find things we urgently need. Instead of constantly spending time searching for things all around the house and getting stressed out, take just a little time now to put in place a new system in your house that will keep it tidy and organized on a daily basis. This is not only a good rule to follow for keeping your home tidy, but is also an effective interior design principle: less is more. Go through the house and remove most of the dust-collecting knick-knacks and extra furnishings that are just occupying space and not serving a real function., Keep decorative items and even furnishings to a minimum. When you display just those items that are functional or that you really love, you’ll have less items to dust and keep clean, not to mention to have to drag around when you vacuum or clean the floors. Plus, your favourite pieces will be highlighted, adding to the décor of your rooms. Few storage solutions are as flexible and inexpensive as baskets and boxes. All décor and discount department stores have aisles dedicated to this versatile clutter-problem solver. Baskets can be used anywhere: in the hall for gloves, scarves, keys; in the bathroom for toiletries; in the kitchen for pantry items, and in the living room for magazines, newspapers and tv remotes. Baskets and boxes come in all sizes and all kinds of nifty contemporary or traditional designs, and are not only very functionable as storage, but also as a decorative addition to your space. Boxes that be put away in an attic or basement are great for putting away seasonal stuff or items not used on a regular basis. But don’t forget to label the contents on each box; It will save opening them all just to locate that sun hat for your upcoming trip down south. There are so many different household cleaning products on the market, but you likely only need an abrasive cleanser and a general cleaning solution, some sponges and rags (paper towels are a convenient option, but probably not the most eco-friendly choice). Fewer cleaning agents and tools are also easier to carry with you (in a small basket or box) as you run around the house completing your cleaning chores. Carrying your cleaning tools with you saves time and energy running back and forth to get each cleaning product. You may also want to consider investing in a robotic vacuum to help do the cleaning for you. And, for those quick everyday cleanups, keeping a convenient cordless vacuum in a couple of strategic areas is a good idea. Group items of the same kind, and keep each group in one specific place. For instance, household cleaning tools could all be under the kitchen sink, instead of some in the kitchen and the rest in the bathrooms and laundry room. Ditto for things like sewing or art supplies, pet paraphernalia, kitchen implements — the list of small household odds and ends that we use on an everyday basis is quite extensive! Keeping each type of item in one place not only saves you time and energy on locating what you need quickly, it also saves you money on buying things you already have but forgot you had them because they were elsewhere in the house. This practice may take a little getting used to, but the payoff is worth it! It’s quite basic: put stuff back to where you got it from as soon as you’re done with it. It only takes a minute. Clothes go back into the closets, wardrobes, and chest of drawers; beds are made; a toiletries, jewellery, and all the other everyday use items are put back into drawers. It’s an attitude change that may require some effort at first (especially if you have kids at home) but once adopted, it will prove an immeasurable time and energy saver at that dreaded Saturday morning house cleaning time! When your house is clutter-free and tidy to begin with, you can then even consider to leave the real labour-intensive nitty-gritty of housecleaning — the dusting, floor washing, carpet vacuuming, appliance scrubbing and bathroom scouring – to a cleaning service. An organized and tidy house takes much less time to clean, especially for professional cleaners, which makes a cleaning service extraordinarily affordable. For more information, contact RBC clean today!